Many a winter Saturday, my friends and I bowled there, at Stadium Lanes on Bloomfield Avenue, between North 7th Street and Roseville Avenue----across from the Italian Tribune newspaper offices; in plain sight of St. Francis Church, and of course Newark Schools Stadium. As far back as I can remember, the lanes were there. They had the unique distinction of having burned down twice-once back in the mid 1950s, and once in the 80s as I recall. The second fire was the end for the lanes. It was about dinnertime in the summer when the first fire happened. I heard all the fire engine clamor and raced to the front door of our house on North 4th Street. Upon opening that heavy wooden door, I stared wide-eyed out over my grandfather’s driveway across the street. There was a huge funnel shaped cloud of smoke in the distance that looked like the tornado in the Wizard of Oz. It towered over the houses and looked like it would go clear out into space. This was no ordinary fire. This was a whopper. “Dinner’s ready Harry, come in and sit down,” Mom called. I couldn’t move or talk I was so surprised. Finally, “Holy cow look at the fire,” I blurted out all at once. We ate a quick dinner and Dad and I took off for the Avenue. Getting to about where the old water tower is on 6th Street, it became very clear Stadium Lanes was a goner. The heat from the fire was intense even a block away, its smoke rising in a thick curling black plume. I was transfixed by the sight and would never forget it. The lanes were rebuilt and many a rainy day exploit there still rings clear in my mind, like the day I bowled a 212 and almost needed oxygen to get home. I could have thrown the ball over my shoulder that day and I would have gotten a strike. Sometimes we would peek in the back and watch the automatic pin-setting machines work. How fascinating to watch the pins move around their wire guides and into the proper position before being set down neat and clean. I bowled at Stadium Lanes even after I got married and moved out of Newark. 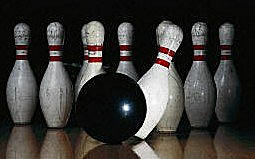 My company PSE&G had a league that met and bowled there for many years, so I joined since many of my co-workers had also been from that neighborhood. We would order pizza locally and have a few beers while laughing and joking the night away. It was a great way to end a weeknight; and home was just a couple of miles away. Funny…….I can still smell the aroma of the lanes. Some things you just don’t forget.